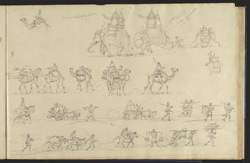 Sketches of the line of march with elephants, camels, hackeries, horsemen and coolies, etc. bl.uk > Online Gallery Home	> Online exhibitions	> Asia, Pacific and Africa Collections	> Sketches of the line of march with elephants, camels, hackeries, horsemen and coolies, etc. Pencil sketches of elephants, camels, horses and carriages etc by Robert Smith (1787-1873) c.1814. The sketch includes hackeries, bullock drawn carriages used for conveying people and coolies, hired burden-carriers. This is one of 27 drawings (29 folios) of views made during a march from Benares (Varanasi) to Bareilly in Uttar Pradesh, probably en route for Almora in 1814. Inscribed on the original cover is: 'No. XIII. Ganges & Luknow'. Captain Robert Smith was a military engineer with the East India Company and was in India from 1805 to 1833. He designed a number of buildings in India and also repaired various Indian monuments including the Kutb Minar and the Jami Masjid at Delhi.